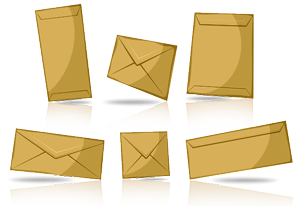 Available in many different sizes, Envelopes can send a variety of materials. We can print any image or text anywhere on the Envelope, so long as there is room for addressing and postage. 1&2 Color printing does not allow for bleeds. For more information, see the "File Setup" tab. These are the standard sizes used for envelopes. If you are interested in a custom size, please use our quote request form. Standard "business" sized envelope with window. Standard "business" sized envelope with a blue tinted pattern on the inside. Standard "business" sized envelope with window and a blue tinted pattern on the inside. 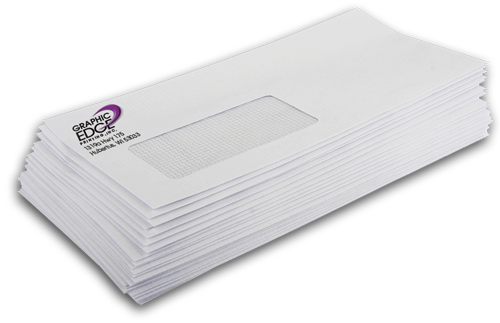 A higher quality envelope with a smooth finish commonly used as part of a business package. A higher quality envelope with a smooth finish and a window commonly used as part of a business package. Standard size envelope used for business reply mail, or return envelopes. A standard white envelope with the opening on the 9" side. A standard white envelope with the opening on the 6" side. A standard white envelope with the opening on the 12" side. A standard white envelope with the opening on the 10" side. A standard white envelope with the opening on the 13" side. Printing in just black on one side of the paper. 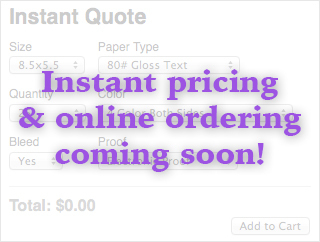 This is used for business forms or simple flyers and is the least expensive method to print. Printing in just black on both sides of the sheet. This is used for business forms, simple newsletters and is the least expensive method to print. Printing in one solid colored ink to give the look of color without the cost of 4-color process. Most commonly used for business cards, letterheads, envelopes, or other business package pieces. Printing in one solid colored ink and black to give the look of color with black text without the cost of 4-color process. These can be combined to produce a wider range of color than only using one. Most commonly used for business cards, letterheads, envelopes, or other business package pieces. Printing using two different solid colored inks to give the look of color without the cost of 4-color process. These can be combined to produce a wider range of color than only using one. Most commonly used for business cards, letterheads, envelopes, or other business package pieces. Shrink wrapping is commonly used for packaging promotional items, or stocking items for easy distribution. Use the dropdown menus to select which template you would like to download. All files are labeled by size as Width by Height (WxH) in the file name. If you do not see the template you need, please contact our art department at: art@graphicedgeprinting.com.